It feels a bit rushed, to be at the last day of May. But, here we are. And if you purchase Stampin' Up! products, you know that, today is the last day, for you to purchase any 'retiring' products. HERE is a hyperlink to my 'store' if you find yourself in need of any retiring products. Now, on to paper crafting! Patrice over @ Sketch Frenzy Friday is the creator of this week's beautiful sketch. At first glance the sketch is a bit 'simple'. But it doesn't lack in possibilities! I used some of the pattern paper that is retiring. I really love this stuff. I cut four equal rectangles and matted them with some pink pirouette cardstock. Ran the whole piece through my sewing machine. The card base is Regal Rose cardstock. I love the two pinks together. I did stamp with my 'splatter' stamp randomly on the card front. 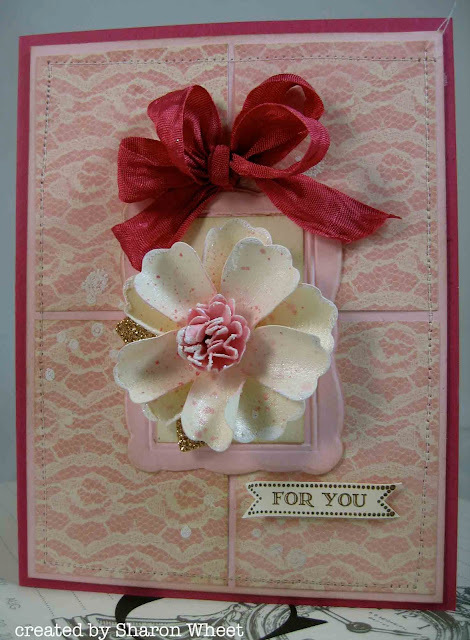 Then heat embossed with white embossing powder, to help give the card a 'worn' look. I fussy cut a 'frame' from pink pirouette card stock. I cut the inside of the frame from very vanilla cardstock. I splattered it with a crumb cake and pink pirouette marker. Created one of my 'Dream' paper blossoms. Punched some leaf shapes, and adhered the paper blossom to the middle of the frame. I used some of the retiring seam binding, to create a multi-loop bow. 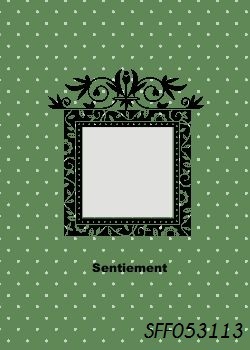 And used the banner stamp set for my sentiment. Not a ton of products, but alot of fun to create! So, join us @ SFF, won't you? We would love to see what you create with this weeks sketch! You can use any products you have. Always love your paper blossoms! And the bow is gorgeous! Beautiful card!